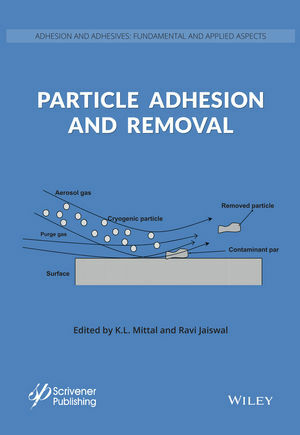 The book provides a comprehensive and easily accessible reference source covering all important aspects of particle adhesion and removal. The core objective is to cover both fundamental and applied aspects of particle adhesion and removal with emphasis on recent developments. 1. Fundamentals of surface forces in particle adhesion and removal. 2. Mechanisms of particle adhesion and removal. 3. Experimental methods (e.g. AFM, SFA,SFM,IFM, etc.) to understand particle-particle and particle-substrate interactions. 4. Mechanics of adhesion of micro- and nanoscale particles. 5. Various factors affecting particle adhesion to a variety of substrates. 6. Surface modification techniques to modulate particle adhesion. 7. Various cleaning methods (both wet & dry) for particle removal. 8. Relevance of particle adhesion in a host of technologies ranging from simple to ultra-sophisticated. Kashmiri Lal Mittal was employed by the IBM Corporation from 1972 through 1993. Currently, he is teaching and consulting worldwide in the broad areas of adhesion as well as surface cleaning. He has received numerous awards and honors including the title of doctor honoris causa from Maria Curie-SkBodowska University, Lublin, Poland. He is the editor of more than 115 books dealing with adhesion measurement, adhesion of polymeric coatings, polymer surfaces, adhesive joints, adhesion promoters, thin films, polyimides, surface modification, surface cleaning, and surfactants. Dr. Mittal is also the Founding Editor of the journal Reviews of Adhesion and Adhesives. Ravi Jaiswal is a chemical engineer and an active researcher in the field of surface and interfacial science. He has authored more than 10 original research publications in the field of particle adhesion and removal. He has delivered more than 10 technical talks in the national and international conferences covering topics relevant to particle adhesion. He is a regular reviewer of the research manuscripts published in the journal of IEEE Transactions on Semiconductor Manufacturing. He has been awarded 'Leighton H. Peebles Award' by The Adhesion Society in 2009 in the recognition to his outstanding graduate research contribution in the field of adhesion science and technology. Ravi completed his bachelor degree in chemical engineering from Indian Institute of Technology (IIT) Kanpur, India in 2004. He graduated with PhD in chemical engineering from Purdue University, W. Lafayette, IN, USA in 2008. He is currently employed at Sun Edison (formerly MEMC Electronic Materials), St. Peters, MO as a research scientist.